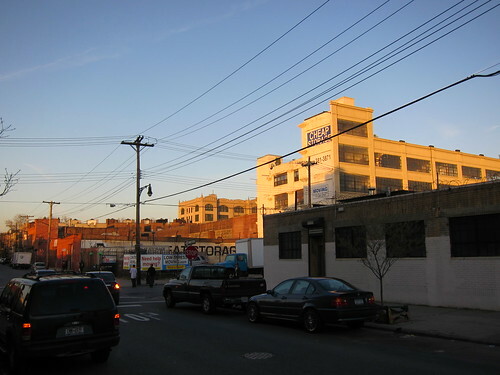 But this visit was ought to be slightly different than previous times since I actually didn’t stay in Manhattan but in Bushwick, the up and coming neighbourhood of Brooklyn. And no, don’t worry, I didn’t abstain on the merits of Manhattan dining (in fact I had a few nice meals there awaiting me), but Bushwick is a florishing hood with more and more “culinarities” to discover and if you eventually crave city food, you’re only 15 minutes away from the East Village via the L line that only takes half a dozen of stops to Manhattan. Thus you could clearly call it a strategically well positioned area. 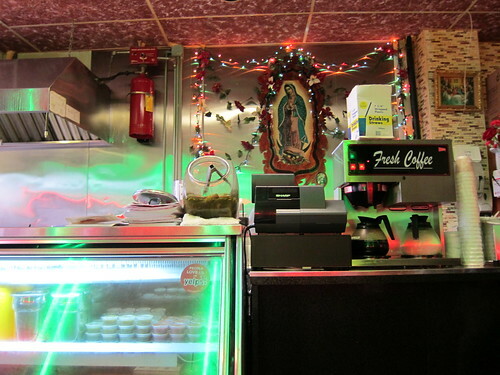 So what’s the first thing I indulged in Bushwick which has a strong Latin community? 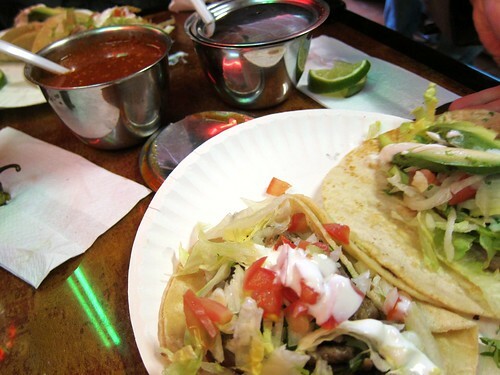 You’re right: Tacos! 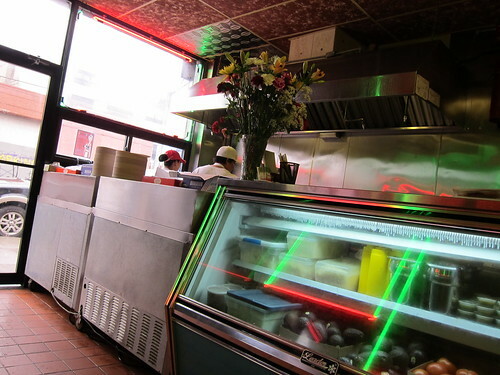 On the same street I stayed is what many call the best Taco joint in Brooklyn. And why would it be the best? 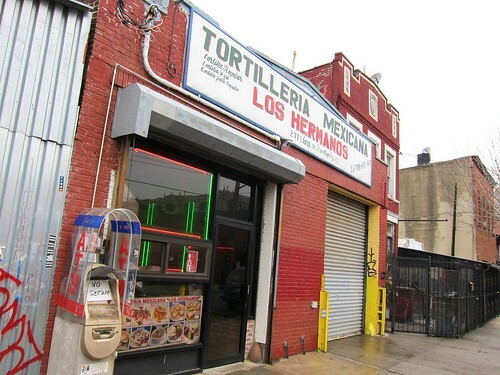 Well the secret is: Los Hermanos is a tortilla factory at the first place, meaning that you couldn’t get a fresher taste than with those just baked tortillas! Otherwise there isn’t any magic involved, just fresh ingredients like avocados, lime, cilantro, chicken, beef or pork, and some spicy salsa. Of course it’s not a restaurant one would come a long way for (some do). It’s a taco joint! A tiny place in a warehouse/factory kind of building with an inbuild cabin for kitchen and seating decorated in a Romeo and Juliet Kitsch style kind of way (the movie with Leo) with a few seats only. No place to take your posh girlfriend. But I’m also pretty sure I haven’t had that good of a taco in Germany. I’d even say that those little things are satisfying at an extent, that Los Hermanos might rank among my favorite casual snacking places. And while the place is small and full of kitsch, there is also a relaxed and genuine atmosphere emanating from it that makes it kind of special. How did you manage to fly to NY? Or was it before the volcano eruption? Yesterday i spend 12 hours in train traveling back home!! In a helicopter ;) ! No, kidding aside, I came back last monday, am just kind of late with my postings, as usual! How was the food in the train? ;) worthy of any blogging? Haha, that was mean. Hope you reward yourself with good food after that ride. I somehow appreciate the silence right now since I live close to an airport, but of course, being stuck in one isn’t much fun! OMG! I take back all my cynism then! :-/ You weren’t standing for 12 hours I hope ! ?